Continuous threat modelling, through code. 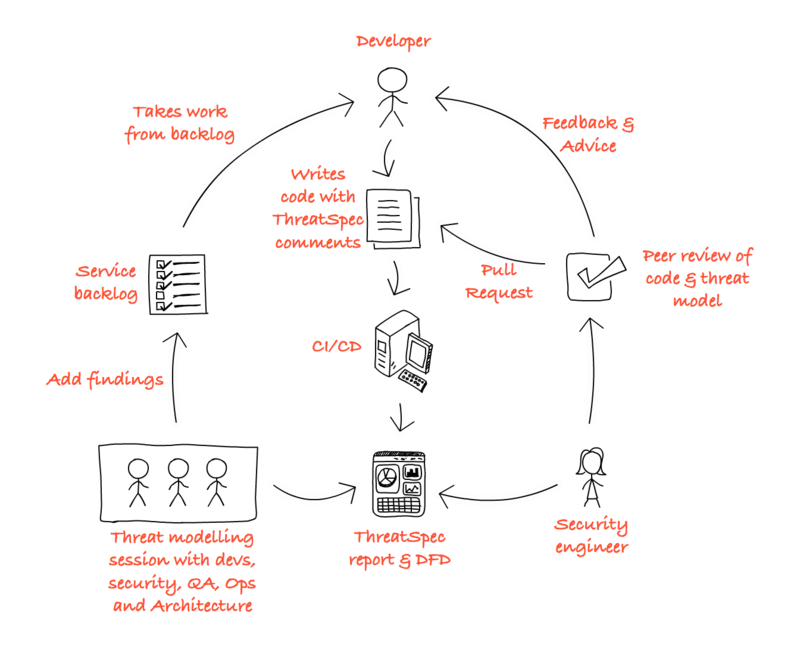 ThreatSpec is an open source project, and our mission is to do for security what unit testing and TDD has done for development. Developers focus on doing what they do best: writing awesome code. And don't forget, when everything is code, everyone's a developer! Developers and QA etc. add threat model comments to the source code, describing security-relevant decisions, concerns, and everything in between. The code and threat model comments are peer reviewed as usual. Security should be involved in the review process, even contributing changes back to developers. High and low-level threat model reports are automatically generated directly from code. Use CI/CD to generate and publish the reports. Automatically generate DFDs every time the code changes. Use these to drive further threat modelling activity, or even display them in the SOC. Peer review and shared language encourages close collaboration between developers and security, helping to identify and fix security issues sooner. In this quick tutorial we're going to go step-by-step through an example threat modelling process, using the pythreatspec universal parser as well as a repoting tool to generate a Data-flow Diagram (DFD). For more information on using ThreatSpec take a look at the wiki: https://github.com/threatspec/threatspec/wiki. Make sure you have python, pip and virtualenv installed. See https://www.python.org/ for details. We're going to use a tool called mermaid to generate the DFD images. You can install node here: https://nodejs.org/en/. This is where we will be spending most of our time. It has the tutorial files as well as the universal parser script. We're going to be installing a few scripts, so let's create ourselves somewhere to keep all of the ThreatSpec directories. All of the below commands will take place in that directory. Clone the GitHub repo and install. This tool will take the output of ThreatSpec and turn it into a file that mermaid can understand. Mermaid will then turn that into a diagram. Follow the instructions here https://knsv.github.io/mermaid/#usage. In this tutorial we are going to threat model a web application infrastructure stack that has been written as a troposphere Python script. The troposphere script creates a Amazon Web Services CloudFormation Template. See here for more details: https://aws.amazon.com/cloudformation/. Inside the pythreatspec repository is the tutorial directory containing all the required files, so let's go there. In this directory you'll see a helper script called run_tutorial_step.sh, we'll use this to run each step. For information on how to use the parser itself, take a look at the pythreatspec code repository. We'll now use the run_tutorial_step.sh script to parse the source file and generate the Data-flow diagram. Looking at the components, we can clearly see that there are two main types of components, namely Web and Database. These should make good starting points for the trust boundaries. We'll run the run_tutorial_step.sh file again. We'll run the run_tutorial_step.sh file once again. Now things are really getting interesting. The above image gives us a pretty good idea of what components there are and how they're connected. We're now in a position to start thinking about the threats against the system. In this example we're going to use the SANS Top 25 (https://uk.sans.org/top25-software-errors/) as a way to guide our threat modelling effort. A lot of the CWEs aren't relevent to our current infrastructure-level perspective, but the section titled Porous Defenses does have relevant threats. Take CWE-311 Missing Encryption of Sensitive Data for example. Thinking about this threat as we look at our Data-flow diagram, one thing immediately stands out. The users are connecting to the Elastic Loadbalancer using http, not https. This is bad. Even if we're not handling credit cards or other very sensitive data, it is still best practise to encrypt all traffic. We may ask the user to log in, so we need to protect their credentials and session details. We may ask them to sign up with personal information, so we should ensure this is protected as well. Or perhaps our service is of a religious, political or sexual nature and we want to ensure our users' right to privacy. So, let's add a note about CWE-311. In the pythreatspec examples directory you'll see a file called cwe_library.threatspec.json. This was created from the CWE xml file provided by Mitre which was processed by the cwe_to_threatspec.py script. If we look for @cwe_311 in the json file, we'll find the alias identifier that we can use in our source code. We can now use the @cwe_311_missing_encryption_of_sensitive_data identifier. In this case, because we've exposed ourselves to CWE-311, we're going to use the @exposes tag, so let's add it. We can go through each of the CWEs in the SANS Top 25 and think about how they apply to our system components. As another example, consider the use of SSH on port 22. For more information, read the specifications here: https://github.com/threatspec/threatspec/wiki/Specifications. We'll now run the run_tutorial_step.sh file for the final time. So finally we have a Data-flow diagram showing not only the system components in their trust boundaries, but also relevant exposures and mitigations of threats. Include and threat model the CI/CD environment that deploys the CloudFormation template. Threat model the web application that would be running on this infrastructure. Use Elevation of Privilege to find new threats. Check out the other ThreatSpec examples: https://github.com/threatspec/pythreatspec/tree/master/examples. Start experimenting with ThreatSpec in your own projects. ThreatSpec is an open source project that aims to close the gap between development and security by bringing the threat modelling process further into the development process. This is achieved by having developers and security engineers write threat specifications alongside code, then dynamically generating reports and data-flow diagrams from the code. Security testing is shifting left, from annual pentests to the realm of unit testing and test-driven development, by taking advantage of automation and agile practices. ThreatSpec is an attempt to continue the evolution. Yes! ThreatSpec code and tools are open source, so they're free to use, modify and distribute. The source code is available on Github. How do I contribute or help out? Drop us an email to [email protected] or send a tweet to @ThreatSpec. People to spread the word, write documentation etc. For a fully comprehensive introduction to threat modelling, check out the book Threat Modeling: Designing for Security by Adam Shostack. What is code-driven threat modelling? Threat modelling has traditionally been driven by the security team, either using general office tools like diagram drawing programs and spreadsheets, or using specialised threat modelling software. They'd either do it in isolation, based on architecture diagrams etc, or would have meetings with developers where they'd do threat modelling together at the beginning of the release. ThreatSpec was created out of a need to threat model an open source security tool, where developers were distributed around the world in different time zones. Workflows were all centered around code, so it made sense to focus the threat modelling efforts around code, fitting into existing developer workflows. We wanted the threat model information to live along side the code, growing and changing with it. This way the threat model always stays in sync with the code, no matter how many MVPs or pivots there are. We also wanted to create a continuous two-way conversation between developers and security. By having developers annotate their code with security information, we would be encouraging them to think about the security implications of their decisions as they went. We also wanted security to be in a position to peer review the changes in real time, taking advantage of code review systems and Continuous Integration / Continuous Deployment (CI/CD) tools. And most importantly, we wanted security to be able to easily provide fast feedback to developers so that developers could benefit from continuous learning. If you know of any more, let us know and we'll add them.